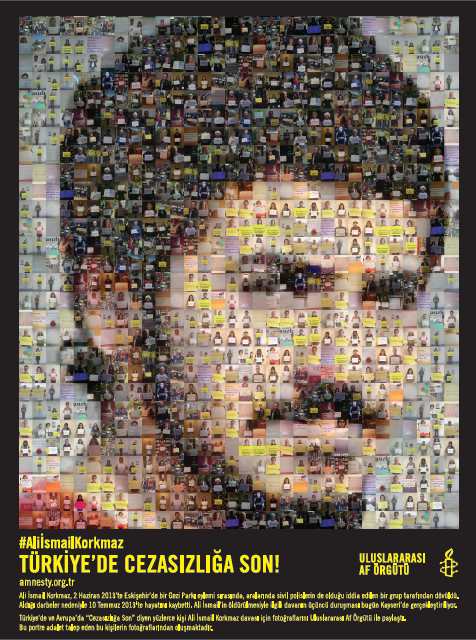 Ali Ismail Korkmaz was among those killed by police violence during the Gezi protests in June, 2013. He was 19. Yesterday, there was a modicum of justice in the case when a Turkish court found six guilty in his death. As so often – too often – happens in Turkey, there was official resistance to a transparent investigation. Amnesty’s researcher on Turkey, Andrew Gardner, noted in a blog last year, Turkish authorities seemed determined to undermine the quest for justice in the case. Following the attack, the Governor of Eskisehir said that police hadn’t been involved and that Ali Ismail Korkmaz had been beaten up ‘by his friends.’ Footage from a CCTV camera was deleted in the days following the incident, but was subsequently recovered by experts from the gendarmerie. 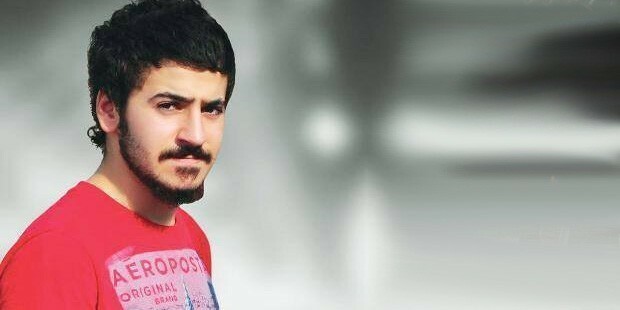 Two police officers, Mevlüt Saldoğan and Yalçın Akbulut were convicted for lesser offence of deliberate wounding causing the death of 19 year-old Ali Ismail Korkmaz and sentenced to 10 years, 10 months and 10 years after reductions, respectively, rather than the charge of deliberate killing under which Mevlüt Saldoğan had been prosecuted, which carries a life sentence. During the trial, a video was shown to the court of the police officers and civilians beating Ali Ismail Korkmaz. Police officer Mevlüt Saldoğan is seen in the video repeatedly kicking him in the head as he lay motionless on the ground after the attack. Two other police officers who were part of the group attacking demonstrators but were not shown beating Ali Ismail Korkmaz were acquitted of all charges due to “lack of evidence”. Three civilians were convicted of taking part in the attack and sentenced to six years, eight months after reductions, A fourth civilian was sentenced to three years, four months for assisting the attack and released from prison due to time served on remand. In its statement, Amnesty draws attention to the difficulties that were faced bringing the case to justice and to the heroic efforts of the Korkmaz family, their lawyers, and journalists in preventing yet another cover-up in a case of police brutality. For its part, Amnesty waged a long campaign to keep the case in the public eye. Nonetheless, this verdict is so important because so few cases of police abuse are successfully brought to trial in Turkey. Two further cases where there is strong evidence that police use of force resulted in deaths at Gezi Park protests remain unresolved. The trial in the case of Abdullah Cömert who was hit by a tear gas canister in Antakya continues. According to witnesses, 15 year-old Berkin Elvan, who died after 269 days in a coma, was also hit by a tear gas canister fired by police. However, prosecutors in Istanbul have failed to identify the law enforcement officers responsible for firing tear gas at the scene. Hundreds of others who were injured by law enforcement officers are still awaiting justice. Indeed, on the day that sentences were issued in the case of Ali Ismail Korkmaz, a secrecy order was issued in the investigation of the killing of 12 year old Nihat Kazanhan, allegedly from a policeman’s bullet. Earlier this month, another secrecy order was issued in the death of Umit Kurt, also allegedly by police. Without transparency, the culture of impunity lives on. Police intervened with teargas and watercannons to #AliİsmailKorkmaz family,lawyers and protestors who were protesting against verdict. At the sentences were issued, the judge reportedly told the victim’s friends and family members that they should not protests in the courtroom, but should instead protest democratically outside. When they did so, they were met by teargas and water cannon. This entry was posted in Amnesty International, Andrew Gardner, Excessive Force, Freedom of Assembly, Freedom of Association, Freedom of Expression, Gezi Park, Impunity, Uncategorized and tagged Ali Ismail Korkmaz, Amnesty International, Andrew Gardner, Gezi, impunity, Nihat Kazanhan, Ruhat Sena Aksener, Umit Kurt. Bookmark the permalink.